TMD is this the new BLT? TMD ( Traction Maintenance Depot I think!) 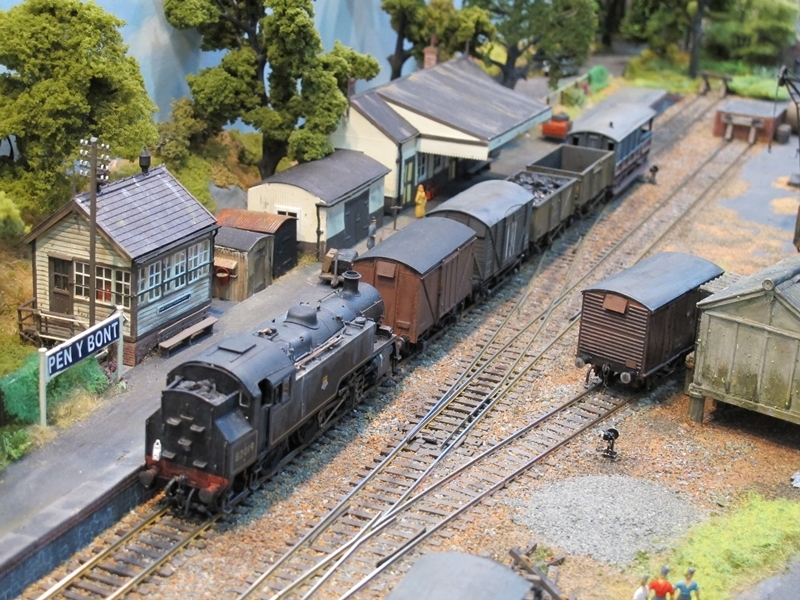 Model railway layouts seem to be springing up all over the place! 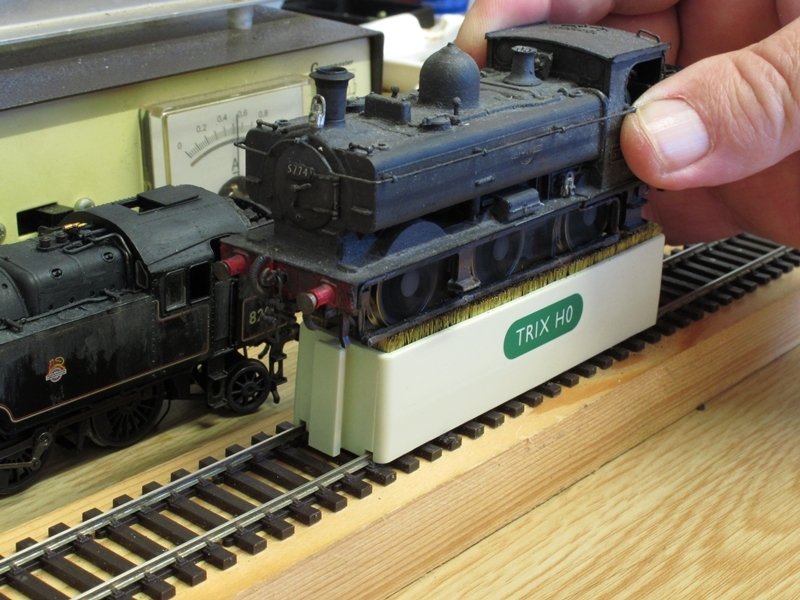 A quick look through any of the well known model railway forums and web rings will bring up dozens of them. But what is the great attraction of these TMD layouts? Like the Old GWR branch line terminus they are now becoming a bit of a cliché. Then there is the question of sound! just imagine the sound of half a dozen class 66s engines ticking over waiting to move off, some of which will sit there for hours on end with their engines idling away, again not very environmentally friendly. I have come the conclusion that those who built these TMD type layouts just want to let people know how many engines they have got! Not what modelling skills they have. Another thing that I have always wondered is why are all such layouts called XXXX Road or XXXX Lane? Rather than something like Bescot, Saltley, Long sight and so on. Strange that. The old faithful GWR BLT (NO, NOT Bacon Lettuce and Tomato but Branch Line Terminus) was the fore runner of the TMD and nearly all space starved railway modellers built one of these, The cliché here being that they are nearly always based on Ashburton or some other equally chocolate box lid looking place in Devon in pre war GWR days, with the ubiquitous class 14xx and auto trailer and 45xx and B set. Most of both these type of layouts that I have had the pleasure of looking at either on the internet or at exhibitions seem to be fully stocked with Locomotives and stock "straight out of the box" with little or no attempt to disguise the fact. I remember on one layout I was looking at seeing two "Hall" class locos from the same manufacturer on the layout together with the same name and number! I thought there was only one "Ravingham Hall" not two! Now those who have read this far without feeling the need to hit the keyboard and fire off a snotty message or equally snotty reply should take note of the fact that I too am guilty of some of the above. My current exhibition layout pen Y Bont is in fact a clichéd BLT. But, in my defence, it is NOT set in rural Devon, But in Rural mid Wales, IT is NOT set in pre war GWR Days, But, near to the end of steam traction on what became BR Western region. I DO NOT operate any RTR locos or stock straight out of the box, all my stock as been customised and weathered to suit the time period I have chosen to model. That includes things like buildings and infrastructure as well as stuff that moves, a far cry from the chocolate box setting that comes to mind when some one mentions GWR and BLT in the same sentence! So what is the point of this blog entry? Hopefully it will make people think a bit more when considering their next model railway layout and avoid some of the well known clichés when doing so. Thanks for reading, and as usual your comments are welcome, please keep replies civil even if you disagree with my ramblings! After reading several model railway forums and looking at the various DCC forum entries it's struck me that something is not quite right some where. "HELP!" or "I have a problem" ??? It seems to me that this DCC malarkey is not a simple as people try and make out. I have always been made to believe that DCC is just 2 wires! Having seen the underside of some DCC layouts at exhibitions and on the internet I think that is a bit of an understatement. Most I have seen seem to resemble the wiring of a Boeing 747 or the starship enterprise! Then there are the posts telling us that we MUST modify all our Peco live frog points as there is the danger of shorting out the track. The number of posts I have read where the words "Blue Smoke" have appeared is also amazing! Don't get me started on lights and sounds! Another two DCC related subjects that get loads of attention. I wouldn't mind but when you are operating your layout at exhibition and all you hear all day is a couple of Class 66s ticking over and the odd sound of something actually moving you have had enough! It does my swede in to quite honest. Steam Loco sound is not much better, I have yet to hear a decent sounding DCC steam loco. Don't they know the difference between the sound of a 2 cylinder black 5 and a 4 cylinder castle or 3 cylinder LNER loco because they all sound the same to me! Don't get me wrong I'm no ludite when it comes to data bus systems and computer machine control , having worked on them in industry for years, but as far as my model railway goes its good old fashioned DC for me! Morfa Bach The build continues! 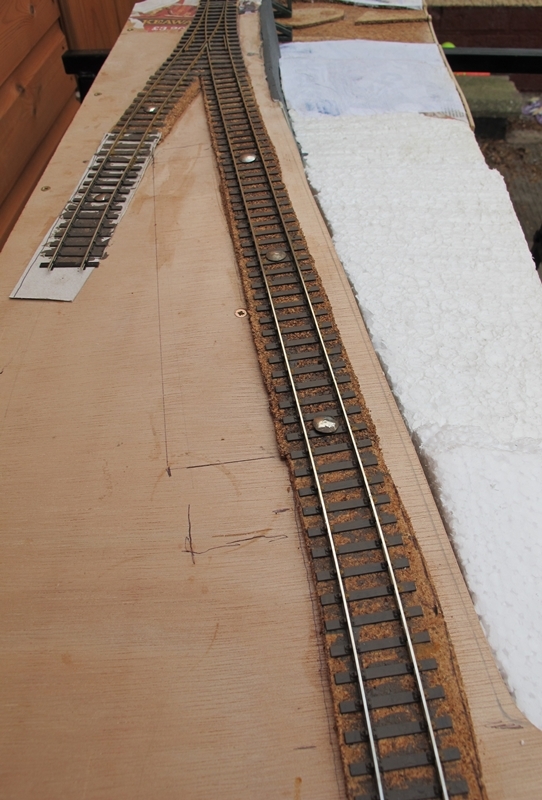 Another blog update on my new 4mm scale model railway "Morfa Bach"
All the track is now laid wired up and tested. 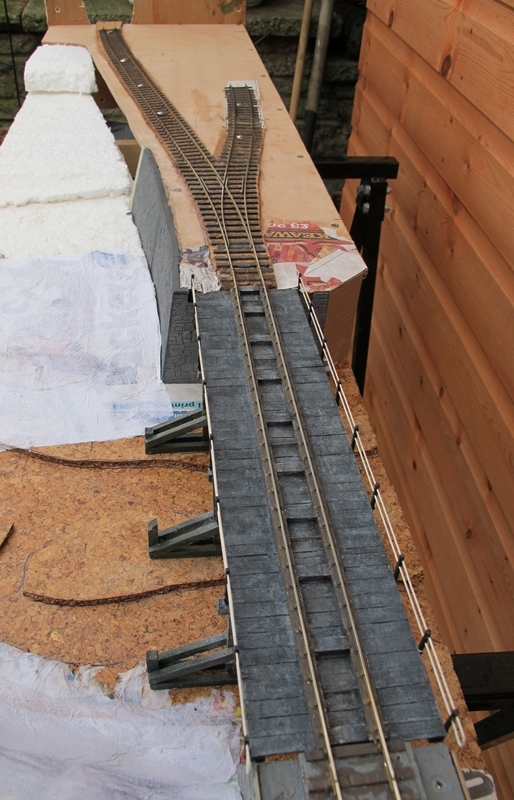 Rails and sleepers have been painted and a start made on ballasting the track. The stone retaining wall is finished and painted. and the entrance to Morfa Bach Tunnel is in place. The area below the wall is still under construction. The sky back scene here is purely arbitrary as very little of it will be seen once the hill side, trees and undergrowth has been fixed in place. Some basic ground cover of hanging basket liner has been glued down to provide the first layer of vegetation at the rear of the bridge keepers cottage. Some Silfor grass clumping has been used in the front garden of the cottage. The "Hole in the sky" will eventually be obscured by some tall trees forming a view blocker once the track is ballasted and other jobs are done. This is a rather cruel close up of the west portal of Morfa tunnel. Painted in grey primer rmore paint work is needed before it is anywhere near finished. I'm not sure of the manufacturer of this item but I believe it is Peco. I have removed the wing walls as they do not fit with the requirements of this model. More will become clear once the rest of the scenery is added. So, folks that is the sum total of my work for this week, I hope to post another update soon. Had to force my self out of my pit at 05:00 on a freezing cold Sunday morning to get myself, son in law and layout to Weston super mare, get set up and running before the show opened to the public at 10:00. Being early on a Sunday morning the M5 was very quiet and the trip from my home in Stourbridge took just over and hour and a half. No need for the sat-nav either as the venue was only half a mile from the motorway. Working between us the layout was up and running by 08:15 so thoughts turned to "nosebag" and a bacon butty was on the cards. However we were soon to be dissapointed as none of the cookers were working in the kitchen! Loads of bacon in trays and nothing to cook it on! The problem was soon resolved when the council engineer was called out to fix the problem, thank goodness for that otherwise it meant a trip to a McDonalds for one of those "Carpet Burgers" . I'm certain they have a bloke in the back somewhere cutting out circles of carpet underlay with a pastry cutter and popping them in a deep fat fryer! That's what they taste like to me anyway! Bacon baps with brown sauce went down a treat and we were then satisfied and ready to run. Pen Y Bont performed well all day without any problems, I wish I could I could say the same about the operators! I don't know what it is but when there is no one watching I can couple and decouple 3 link couplings without much trouble, but, no sooner you get an audience then every thing goes belly up! Some thing to do with Murphy's law I believe, but I never found out who Murphy was! Regular readers of this piffle blog may have read some time ago that my Collett mogul has "had it" After a successful win on Ebay I ended up with a complete loco, From this I swapped the chassis into my original loco. I'm pleased to say that the transplant was successful and the engine ran as sweet as a nut all day. Comments and remarks made by several punters looking on seemed quite favourable and I have a couple of provisional enquiries to attend exhibitions in 2013. 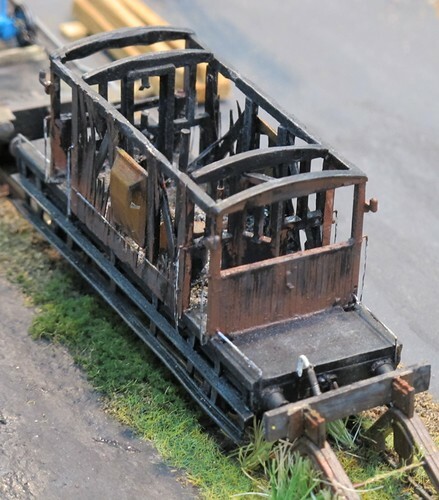 Most viewers seemed to comment on the burnt out brake van that forms a static cameo on the layout, I think more pictures were taken of this than anything else. I shall be posting some pictures of some of the other stuff that took my eye later. The exhibition was very well attended and for a one day event was excellent with 26 layouts and 14 traders, more than some of the well known 2 day shows. Attendance was up on last year with over 1000 tickets issued by lunchtime, I'm not sure what the final figure was but i think I heard someone say 1500. All monies raised going to a good cause. We had got everything packed up and were on the way home by 16:50 or thereabouts. Not a bad time to dismantle, pack, load and go considering we still had stock on the layout at closing time 16:30. So there you have it, another plaque now adorns the front of Pen Y Bont. Back to work on the new layout now this one is over, no more shows now until September. Another load of waffle from me soon! And the wheels go round! Having read the comments about track cleaning on one of the model railway forums got me thinking one thing that is often overlooked is that of keeping the wheels and pick ups clean. It was while I was getting my stock ready for tomorrows outing to Weston that made me think that the wheels are often overlooked and poor running is not just down to track problems. To clean my wheels I use this handy device. Supplied by a certain Cornish emporium, it's not cheap at nearly £23, but, the time and trouble saved it's well worth the money. I understand that there is a N gauge version available but I stand to be corrected. Location,Location, Location, Where is Morfa Bach? As people are starting to show interest in my latest modelling project, Morfa Bach, I thought it would be a good idea to let you know where my prototype inspiration came from. So using Google maps I've posted a few links to the area my project is located. First of all is this aerial view of Dovey bridge, the bridge keepers cottage still exists to day and can be seen on the left bank of the river in this shot. If you pan out a bit the bridge I have modelled can be seen crossing a tributary on the right, on the Aberystwyth line. This is the view from the road above the entrance to Morfa Bach tunnel, The stone faced embankment and salt marsh can be seen. This shot is a little further on towards Aberdovey and again the stone faced embankment can be clearly seen as can more salt marsh. My layout is fictitious, but is based on this section of the Cambrian coast line, using some of the features seen in the above links to Google maps. I hope to capture the atmosphere if not the exact location. So, consequently I have to wait for suitable days to work outside in the fresh air. Today was exceptionally mild for early January so out comes the saw bench and wood butchering tools! Not a great deal was done really, I just made the left hand layout end with it's frame and hole for Morfa Bach tunnel. Stood up on trestles outside of my workshop you can see the left hand end board which is today's work. The head of nickel silver now extends to within 70mm of the end of the layout and now the end is in place will be extended to the end soon. A start has been made recently on the retaining wall for the raised track embankment, and polystyrene sheets some 1" thick have been layered to form the ladscape at the front. Here is a view from the right hand end of the layout. Drawing pins will continue to hold the track down until ballasted even though the PVA fixing the track is well dry now. The single siding with catch point has yet to be extended. The siding being a scale 1ft below the running line. The view from the other end shows the track level dropping down to baseboard level a little bit clearer. That's about it then for the time being, loads of work left to do so watch out for more updates as and when.